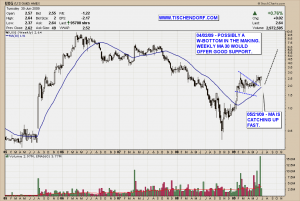 One of the few gold mining stocks that were up today and also closed near the high of the day was UXG – US Gold. I see a successful test of the weekly MA 30 and a retest of the flag pattern after the recent breakout. The pattern looks like a W-Bottom. UXG benefited from the recent Russell 3000 rebalancing. An increase in volume is a good thing as it increases awareness and traders scanning for volume take notice. Institutions will probably need to buy more shares over time. By the way same applies to MRGE – Merge Healthcare. Volume surged on the rebalancing day. I think odds are high we will see a thrusting move to the upside with separation from the MA 30. Right now I am very bullish on UXG. 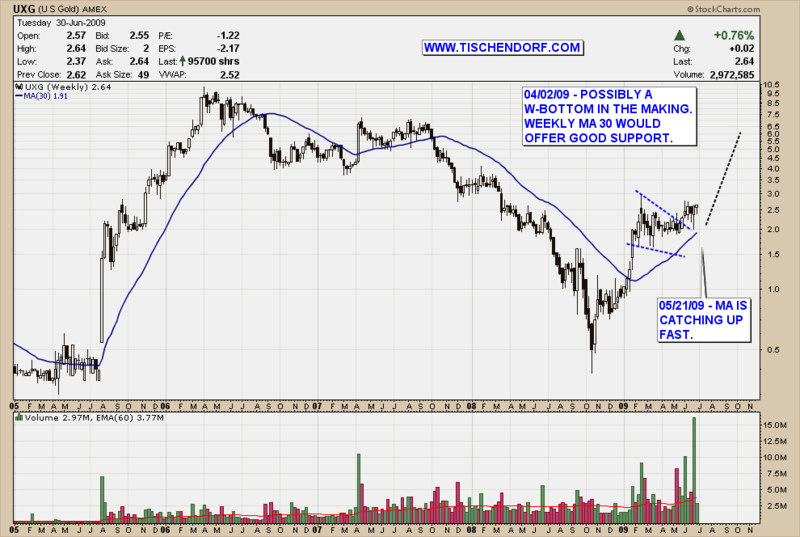 Here is my weekly chart of UXG. For charts with up to date annotations check my public list. This is the most recent Rob McEwen video who is CEO of UXG – US Gold on BNN. Canadian markets are closed tomorrow.